This gorgeous lace stencil Stephanie's Lace is very intricate, yet is very sturdy, easy to use and quite forgiving. Nothing says "feminine" more than lace patterns! This wall pattern will look absolutely stunning in your room, especially on an accent wall. This lacy stencil design can be used on floors and fabrics too! Think curtains and tablecloths, also table tops and pillows! 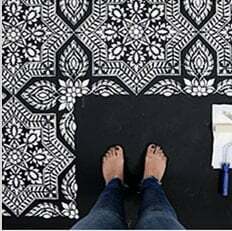 Intricate lace stencils are super trendy and are sure to bring a feminine touch to any decor. Stencil wall patterns are a great money-saving alternative to wallpaper. A must for any creative DIY decorator. Stenciling offers complete customization of your space with unlimited paint choices to perfectly match your decor. And re-decorating is a breeze, unlike stripping wallpaper! Just paint over it, and you're ready for your next DIY decorating adventure. For alignment please refer to the pics. Stencil aligns easily vertically and horizontally for a seamless wallpaper effect by slightly overlapping and locking in with previously painted parts. No need to wait for the paint to dry between repeats, if you're stenciling with flat paint over flat background (which we recommend), the paint dries very quickly between repeats and no smudging should occur. Most of our stencils do not require the use of spray adhesive, and this particular pattern is very forgiving. The possible paint bleed is barely noticeable with this pattern. But if you want to minimize paint seepage or are using high contrasting colors, spray adhesive is very helpful (Elmer's spray adhesive seems to be the best). Make sure you shake the can well and lightly mist (not drench) the stencil, and let it dry for a moment before positioning it on the wall. This step will prevent the adhesive residue transferring to the wall. You'll need to re-mist the stencil after a few repeats. Note: you will still need to hold the stencil in place with a few pieces of blue painters tape! Adhesive by itself is not enough to hold the stencil on the wall. Clean-up tip: Spray the stencil with Simple Green to help to remove adhesive residue. We recommend using any alover stencil with our Clip-on Stencil Level, (sold separately). Discover how easy it is to achieve perfectly level results without dealing with all those bulky heavy bubble levels and expensive laser levels. We cannot recommend the Level enough, it's a real time-saver and is so handy!